Some of my favorite memories of my time in London during this visit were the plays and musicals I was able to attend. 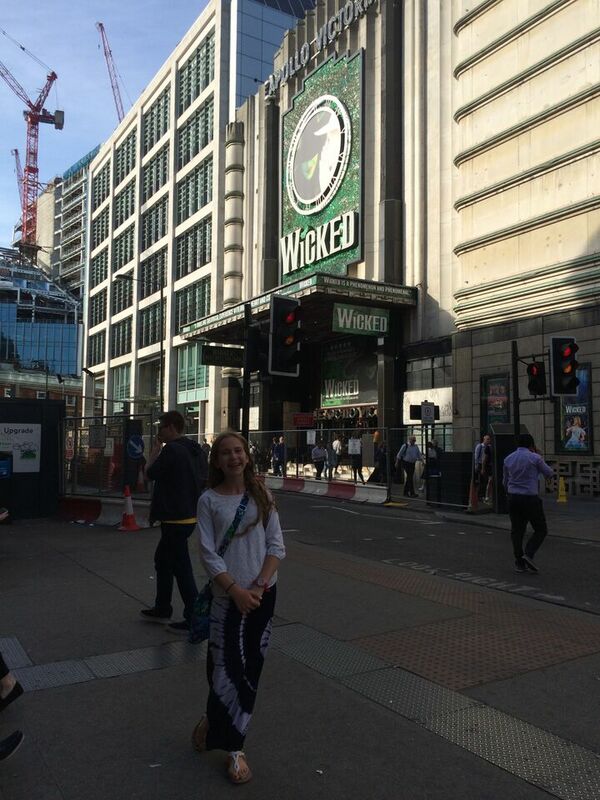 When my daughter was visiting, I took her to see “Wicked.” This was the first Broadway/West End style show she’d ever been to. I think I had more fun watching her reaction’s to the play itself – though I did enjoy the play as well (my second time seeing it in London). She was mesmerized and is now wants to see more shows! 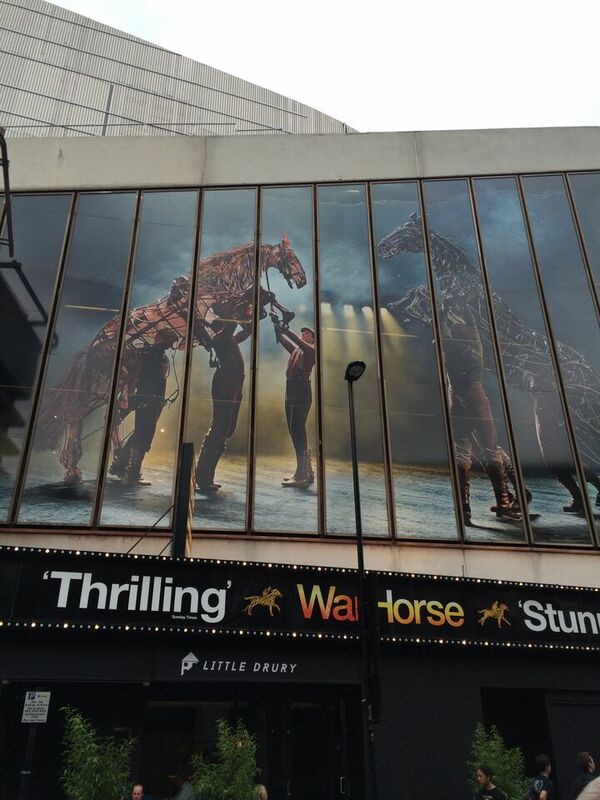 I also saw “War Horse” which was phenomenal. It doesn’t take long to not see the puppeteers maneuvering the large horse around stage – all you see is the horse. One evening Herb, one of the program co-directors, and I decided to walk down to the West End to see what last minute tickets were left for some of the shows. 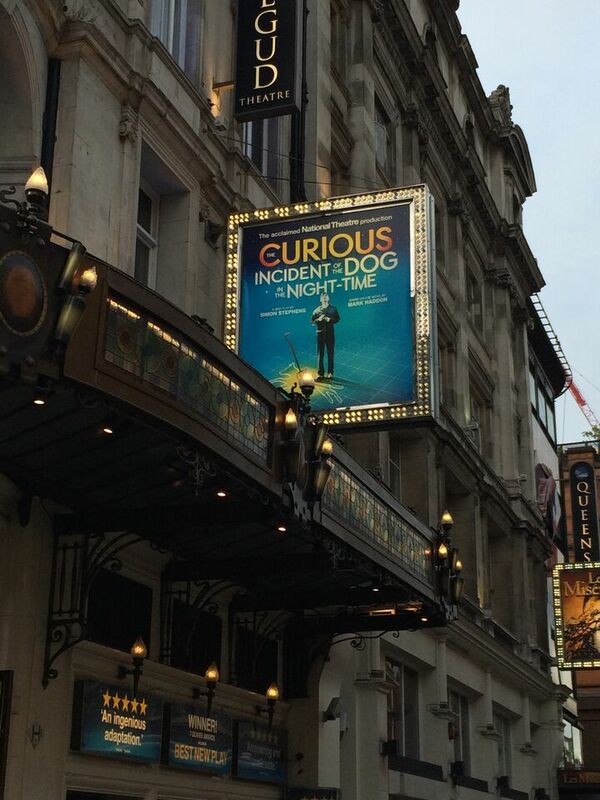 Since the only seats available for “Les Mis” were over 90 GBP or standing only (and I’m not standing for three hours for a show), we finally found open tickets for “The Curious Incident of the Dog in the Night Time.” It was fantastic! The stage was like nothing I’ve ever seen. It was a great show that really pulls at the heart strings! 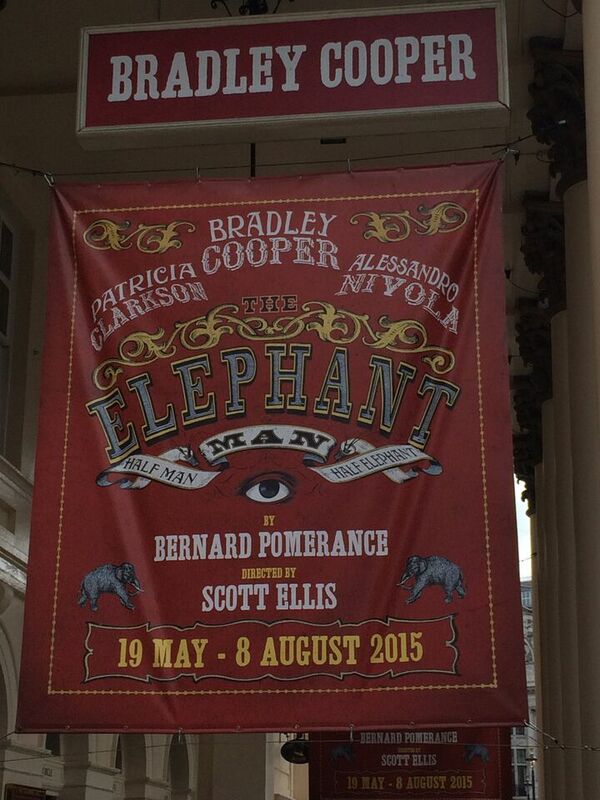 The final show I was able to go to was “The Elephant Man” starring Bradley Cooper. 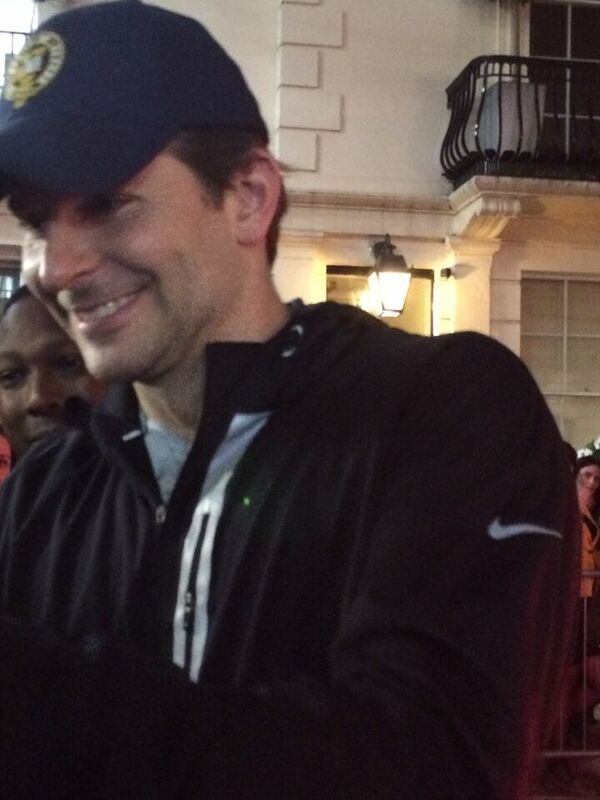 Going with my colleague Jamie, we went to the stage door before the show and were able to see Bradley arrive. The show was nothing short of AMAZING. Bradley really showed his range as an actor by transforming himself/his body physically to become and impaired individual, to become the elephant man – with no makeup or prosthetics. After the show Jamie and I waited again at the stage door for him to hopefully get his autograph on our programs. 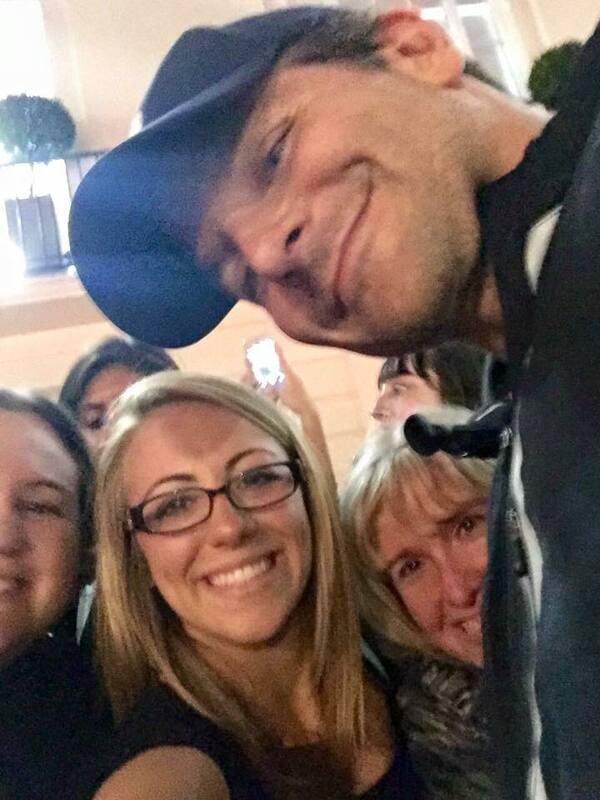 We were finally rewarded as he emerged from the theatre and took photos and signed autographs. He was so nice and polite! What a way to top off this trip to London! During the study abroad experience, each week I took my classes on field trips. Mondays were with the public speaking course, while Wednesdays were with the public relations writing course. First, I’ll describe the field trips for the public speaking course. 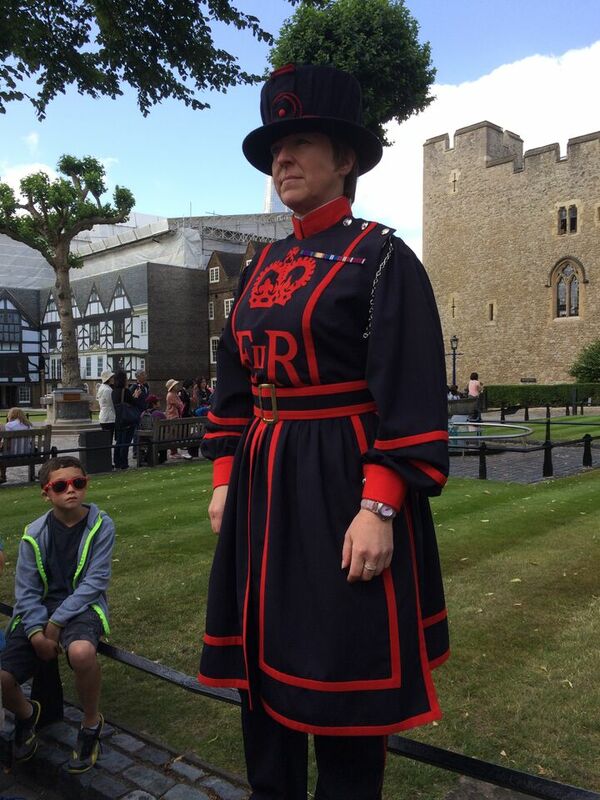 Their first field trip was to the Tower of London for a Yeoman Warder tour. Our guide was the first, and at that time, only female warder. To be a warder one must have served in the royal military for 22 years and have exemplary service in order to apply for the position. Our guide told us it took her six months to learn the script for the tour. She was a spectacular guide and showed the students how practice makes one a terrific public speaker. Following our tour, the students were able to explore the Tower, see the dungeon, the armory and the crown jewels (always a favorite of mine). From here we went to the Victoria & Albert (V&A) Museum for a tour of the British Galleries. Where our Yeoman Warder was the epitome of what to do as a public speaker, our guide at the V&A was the complete opposite. First, our guide was a volunteer of the museum and a very nice man…he just needs to learn how to speak to a crowd without making them uncomfortable. Instead of giving facts about the room we were in and the artifacts within, he often would stop and make direct eye contact with one person in the group making them uncomfortable. A great day as students saw the polar opposites of what to do and not do in public speaking. The second field trip day for the public speaking students was to the Science Museum. Working in pairs, I assigned them a specific aspect of the Information Age exhibit to present in class the next day. From here we made our way to Regent Park where they gave an impromptu speech. Third field trip day was to the UK Supreme Court. What I thought could be an interesting site, turned into another dud. Our guide thought the class was there to learn about debating, not public speaking, so he didn’t really know what to talk about. With no court cases happening, we weren’t able to see anyone “in action.” After a quick bite for lunch we went on a Harry Potter walking tour. Our guide was animated and kept the group interested and involved throughout. The final field trip for the public speaking course was to Kensington Palace (former home of Queen Victoria, Princess Diana and Will & Kate). After the students explored the palace, they delivered their special occasion speeches in the palace gardens. Field trips for the public relations writing course were, in my opinion, some of my favorites! Their first field trip was to the Museum of Brands, Advertising & Packaging. It was located in a small, out of the way, location in Notting Hill, but it holds so much history – back to the early 1900s! It was interesting to see how brands and their looks changed throughout the years. The class was divided in pairs with specific items to locate which they discussed in class the next day. 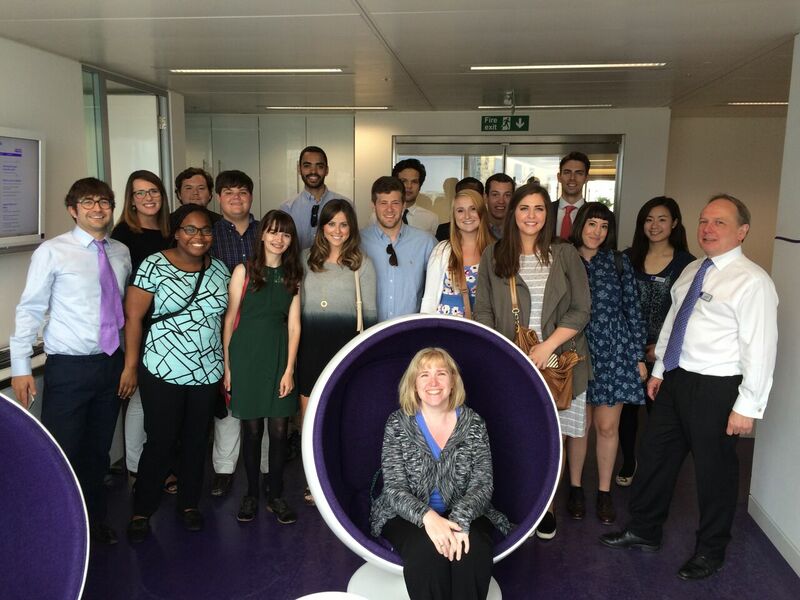 After lunch we headed to the BBC for a tour of the BBC Broadcasting House. 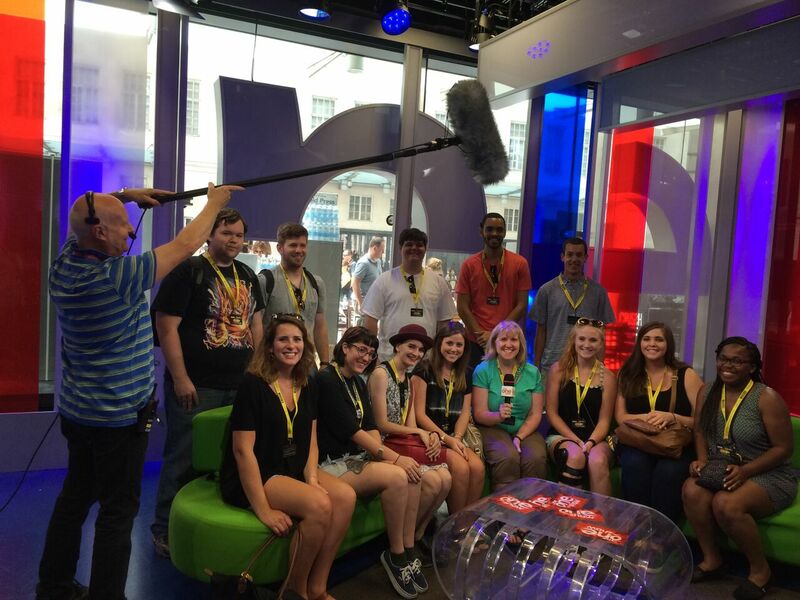 On the tour we saw the newsroom and sat on the set of “The One Show” (pictured left). In one of the rooms, two of my students (Lila & Josh) were able to be “newscasters” against a green screen, while another student (Sydnie) did the weather report. In another room students participated in a radio drama. On their second field trip we visited Abchurch Communications, a public relations firm specializing in financial public relations. Julian Bosdet, the chief executive at Abchurch, began our visit with an overview of the company, describing their communication toolbox. This was followed by Jamie Hooper, director, discussing digital communication. Following a lunch provided by the firm we talked about differences in PR in the United Kingdom and the United States including social media, crisis communication and sports. After lunch they hosted a brainstorming sessions. I was so glad to be able to visit the firm for students to get a first hand look at what life is like for a public relations practitioner and for these gentlemen to give us part of their day was priceless. The third field trip day for the writing class was probably my least favorite (and for some of the students as well). We visited the Science Museum and the Information Age exhibit. The 12 students were paired up, given a topic, told to research it and present it to the class the next day, including how to use PR to publicize that part of the exhibit. After a bite to eat, we headed to the Freud Museum. Since the “father of modern public relations,” Edward Bernays, is the nephew of Sigmund Freud I thought it would be interesting to visit the museum to find what it included with regard to psychoanalysis. The answer – not much. While the house and grounds were beautiful, there wasn’t more than one wall on the topic of psychoanalysis. 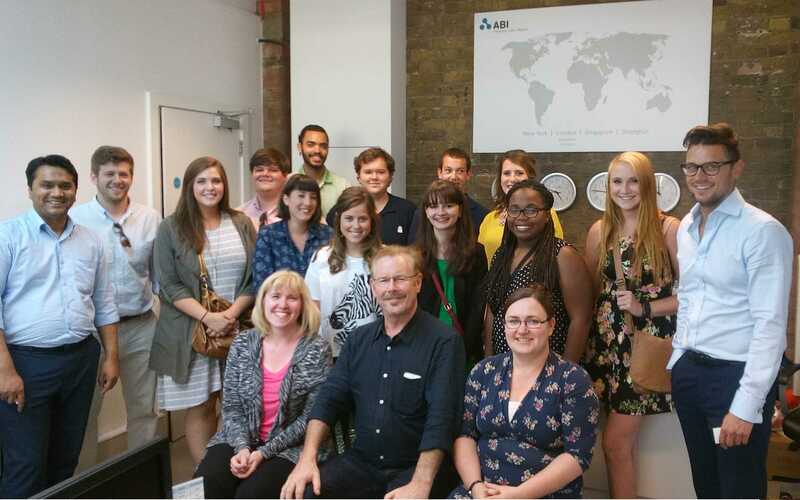 For the final field trip for the writing class we visited another public relations firm, ABI Marketing Public Relations. The staff were very welcoming and presented a lot of great, valuable information to the students. They gave the students the same writing test given to anyone wishing to intern or work for the company. The “winner” of the competition was given a large box of chocolate! 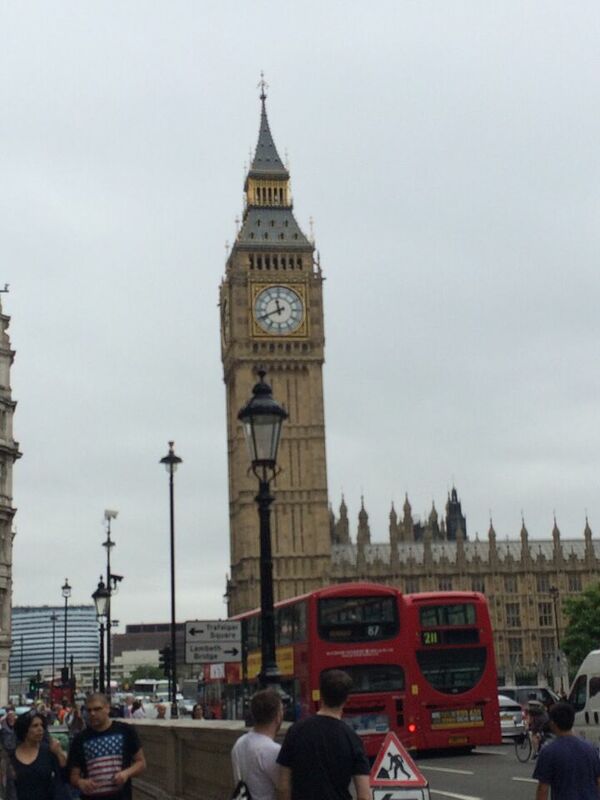 This summer I had the opportunity to visit London, England, as part of the study abroad program with the European Council in Georgia. I was one of eight professors from the state of Georgia selected to teach two classes in London. Our students were from colleges and universities around the state including Georgia Southern University, Kennesaw University and West Georgia University. I taught two classes: Principles of Public Speaking and Public Relations Writing. As I have time I will add posts detailing some of the fun adventures had and places visited during my five-weeks in London. To anyone considering studying abroad – do it! It is great to experience another culture and to see things you just can’t in America. At times I felt like I had stepped back in time when visiting castles, prisons and museums. While it’s expensive to travel and/or study abroad, the experiences and connections made are worth it.